Painters make their own medium contains drying oils , resins and something additives . There are two ways for making own madium . 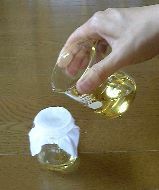 Soft resin such as damer, bees wax or some kind of additives can be dissolved into medium by volatile solvent such as Turpetine. You can mix them in nomal temperature. It's the most simple way . The 2nd way is dissolving resins and additives into drying oil directly by heating ( Dammar and Mastic melts under 100 degrees centigrade. Also bees wax too ). In this way , you can mix them without Turpentine. This page teaches you to make your own medium by the 2nd way . * Dissolving Copal demands over 200 degrees centigrade. See How to make Copal Medium. Every painter may hove their own recipt, but now if you try first, I recommend the following table. Put all materials ( dryinf oils, resins, bees wax ) into the beaker. 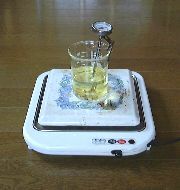 Ant stir the medium in the beaker while heating it ( See the following picture ). Around 90 degrees centigrade , resins start to melt. Stop the fire when it's over 100 degrees. When it's still hot, move it to empty bottle. Remove the un-melting substance and dust by filtration. In addvance attach the gauze on the mouse of the bottle, and make a hollow by the gauze and tie it by rubber band. Then pour the medium into the bottle through the gauze ( see the right picture ). Finally, put the label written dwon its recipe and date.